Today I’m talking about a little trick that’s saved me so much time while writing first drafts, and I’m so excited to share it with you! Sometimes, it really is the simplest things that can make the biggest difference. Give this technique a try and let me know what you think! 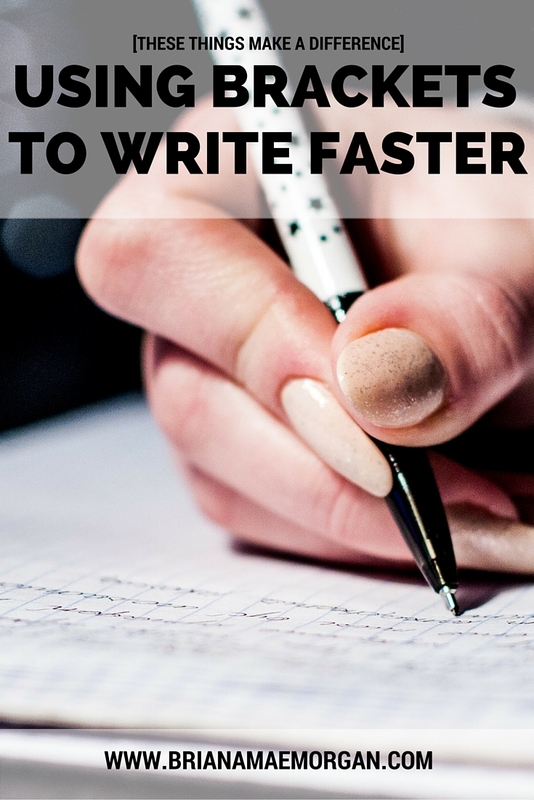 In her book, Writing Faster FTW, author L.A. Witt shares several techniques that have helped her write several books a year at impeccable speed. I’m a huge fan of fast drafting and picked this book up hoping to learn some useful tips and tricks to improve my writing speed. One of Witt’s favorite techniques involves the use of brackets. If, while writing, you get to a point where you don’t know what to put for a character’s name, eye color, or dialogue, toss in some brackets! Then, once you’re finished with the draft, you can search for the brackets and beef up the manuscript as needed. With her father out of the room, the restaurant felt [adjective], cold, and unsettling. The television, which had gone to a commercial break and was blaring [description of ads], was far too loud for human ears. Rama’s hands trembled as she picked up the remote again and turned the whole thing off. She [phrase about safety even though it meant she had to face her [adjective] thoughts without any distractions. With her father out of the room, the restaurant felt cavernous, cold, and unsettling. The television, which had gone to a commercial break and was blaring insurance ads, was far too loud for human ears. Rama’s hands trembled as she picked up the remote again and turned the whole thing off. She felt safer in the silence even though it meant she had to face her racing thoughts without any distractions. Interesting, right? At any rate, it’s readable. And I couldn’t have gotten that paragraph finished as quickly without using brackets. If you’re working on a first draft, I highly recommend using brackets when you’re drawing a blank on details. They can be used for everything from names to hair colors and even whole descriptions. Instead of getting bogged down in the details, let brackets do the heavy lifting. You can go back and fix them with the first draft is finished. What are your tips for writing faster? Have you ever tried using brackets?